Air Cleaning Technologies (ACT) provides environmental and indoor air quality services for government and commercial buildings, hospitals, and laboratories and other facilities. In addition to testing, cleaning, maintaining and restoring systems, we work with contractors, architects and engineers to design and develop new systems and solve specific environmental challenges. 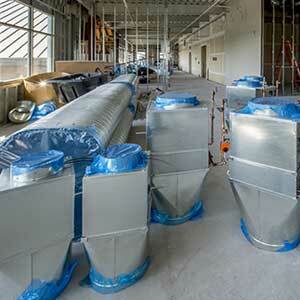 ACT specializes in high-efficiency air filtration systems for the removal of CBR contaminants. We offer custom air handling units, filtration systems and field-build systems. Enjoy pure, clean air with comprehensive design, testing, cleaning and maintenance. Get the replacement filters and products you need now. Our huge warehouse is stocked with standard sizes and supplies from leading manufacturers. The ACT staff can help with advice and service to extend the life of your system, increase efficiency or reduce repairs. Air Cleaning Technologies, Inc. (ACT) is the region’s leader in air handling systems, reconditioning, support services and supplies for government and commercial buildings, hospitals, laboratories and other facilities. We ensure our clients enjoy air environments that are clean, safe, comfortable, and compliant.